(Bloomberg) -- Long lunches and scenic walks may beckon U.S. traders this week following the recent sprint, but they’ll relax at their own risk. Sure, the U.S. calendar of events is sparse. And despite a flood of news, last week was actually pretty boring, with 10-year Treasury yields moving only about 7 basis points, an average weekly move for 2019. But given the fragile state of the global economy, investors may find more to trade this week in China’s retail sales and eurozone consumer prices than in the marquee American report on industrial production. 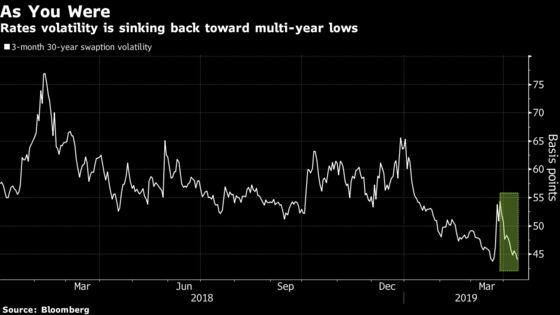 Moreover, focusing on the subdued volatility trend makes it easy to forget that over the past three years Treasury yields have covered a lot of ground, often quickly, said Robert Tipp of PGIM Fixed Income, a $716 billion money manager. “With all the confusion in the markets, along with the fundamental economic and policy uncertainty, that pattern should continue: alternating periods of range-bound noise, and jarring, significant shifts,” the chief investment strategist said. Volatility has subsided from a late-March surge, as recent economic data have eased fears of a recession in the U.S. The Federal Reserve has stuck to its script that it’s on hold, and this week’s Fed speakers are unlikely to stray far from a message that’s comforted markets. But that confidence depends to a large extent on other global growth engines not failing and turning a cyclical U.S. slowdown into something worse. “What would trigger volatility is any change in the potential growth or inflation backdrop, whether that’s the U.S. or in the global market,” said Alexander Dryden, global strategist at JPMorgan Asset Management. In his view, the lock-step movement of German and U.S. benchmark yields is evidence of how closely tied their economic fortunes are right now. An updraft in the German 10-year yield Friday helped lift the U.S. counterpart to a three-week high of 2.57 percent. This strong correlation will continue “because their economic trajectories are so interlinked at the moment,” he said. For this holiday-shortened week, Dryden thinks Wednesday’s European consumer price index data could be surprising. He sees potential for a pickup that could bring an ECB rate hike back in play around year-end and prompt a knee-jerk jump in yields. That said, he believes that the 10-year Treasury yields will only start to trend higher in the second half of the year, and then only gradually, to around 2.60 percent. PGIM’s Tipp is positioning for long-dated yields to remain tethered to this slow-growth environment, pushing the curve a little flatter for now. “And that should be the case until it either becomes clear that the economy is re-accelerating, or it becomes clear that the Fed has decided to bite the bullet and cut rates,” he said. It’s a slow week heading into Easter. The U.S. economic readings are mostly lower-tier reports and the Fed speakers aren’t in the group that sets central-bank policy. Markets are shut Friday.